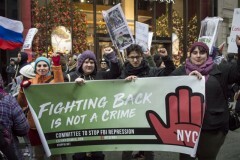 New York Spring Action against war | Fight Back! New York, NY - Over 1000 people gathered at Herald Square on Sunday, April 15, to rally against U.S. wars abroad and at home. The event was part of a national call for Spring Action, where anti-war groups came together to speak out against Trump’s attacks, as well as U.S. imperialism. The protest itself happened just days after Trump launched more missiles at Syria. The speakers included veterans, students, labor activists and national liberation groups. Each gave their own perspective on why everyone should oppose U.S. wars. Many spoke to the amount of money spent on war, as opposed to social programs, and the importance of standing with people living in countries targeted by the U.S. The protest was organized by the United National Antiwar Coalition and many others.